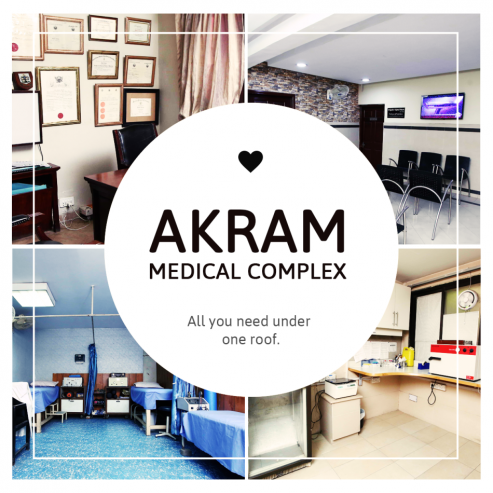 Akram Medical Complex has established around 25 years ago. They made this hospital, with the only purpose of serving our patients. Their patients’ lives are our asset and they put all our effort to provide them the best quality services. It is hard to make a hospital and run it for 25 consecutive years. It took us a lot of time to put piece by piece together and build this hospital. Dr. Javed Akram is a highly reputed Professor of Medicine in Pakistan. He is an author of six books and 400 research papers presented in International/National meetings/symposia and seminars and rendered valuable services through participation in numerous. Their motive was to provide complete services to the patients. No one should be deprived of the care at the time of illness. For Akram Medical Complex they used to do our practice medicine and treated many patients there. But, after sometimes the number of patients increased. So, the idea of making a hospital came into their minds. It was hard for manage their practice and run the hospital. For running a hospital, a team is required, but I did not have a team, so I did what I had to do. There were a lot of sacrifices that were made to create this hospital, but they believe they all were worth it. The building of Akram Medical Complex is spacious and updated according to the modern architecture. The building of Akram Medical Complex has a capacity to accommodates state of the art machinery, hundreds of patients and visitors, and a huge staff. The hospital Akram Medical Complex is aesthetically refreshing, the entrance of the hospital has a pleasant view for the visitors. The building Akram Medical Complex is renovated after every short period of time. The environment of the hospital is kept clean, with the regular check and balance. They used to be at the hospital all the time, putting all their efforts to execute their dream. Their main focus was to the satisfaction of the patients. They personally checked up on them and called them for follow ups. Patients from all over the Pakistan came to our hospital. It was a positive and overwhelming response that motivated us to go forward, but with the increased number of patients, they had to make certain amendments. Their personal preference was to deliver patient all the help that they need so that they did not have to go somewhere else. They have focused on keeping the cost economical, so the patients do not feel burdened. They belief and direction to run the hospital rely on this statement. They provide medical care to the patients which are financially weak and they do not discriminate in the level of serving. Every life is important, and it is their duty to provide services to them. They have worked really hard to update their services according to the demand of patients. These statistics define the importance of private hospitals, and they have to maintain the standard to be one of the best private facility in the country. They kept on evolving and updating services by reviewing our past experiences. They have an excellent Internal Medicine and diabetes department. Their cater patients with different diseases like asthma, chest pain, insulin treatment, and thyroid disorders. Dr. Javed Akram is one of the finest doctors in the country. He has a huge following and treated around 90,000 patients in his career. He has received numerous accolades all his life, one of the most valued awards is the pride of performance. Most common diseases that he treated are diabetes, anemia, fever, and hypertension. All of the tests regarding the department of internal medicine are available. A lot of women visit their hospital because of well-known gynecology department. They have updated machinery for an ultrasound, sonogram, x-ray and other important tests. Prof Uzma Hussain, is a great name in the field of gynecology. Her services include caesarean Section/ C-Section, clinical Breast Examination (CBE), contraception advice, delivery, epidural analgesia, genetic testing, gynaec problems. Her patients have a positive opinion about her, which makes her a top choice for the patients. She also gives online consultations to her patients. Also, she well versed in her respective field, because she has a rich experience of teaching as well. Another asset of our hospital is Dr. Sara Ejaz, She is a very experienced gynecologist, her services include, infertility treatment, labor, laparoscopy, obstetrics, poly-cystic ovary syndrome, post-menopausal bleeding, tubectomy/tubal Ligation. Women feel comfortable in visiting her for their medical concerns because she has a very understanding and humble nature. They also have a strong portfolio in the pediatric department. Parents are deeply concerned about their children, so they take their kids to the best doctor. Hence, they have a lot of concern patients, who have put faith in us. A lot of patients visit him for follow ups, and he is one of the highly recommended doctor. Dr. Yaqoob, is another great doctor, his services include growth & development, immunization, nutrition assessment, short stature, vaccination and other common issues. Their department of neurosurgery has come a long way. They worked hard to form a credible and competent department of neurosurgery. They have the finest equipment and a team of great doctors. They accommodate all types of illnesses, for that, they have researched about all basis. Their orthopedic department is very active and it covers all the bone related issues, for instance, arthritis Management, bone trauma, fracture treatment, joint replacement surgery knee replacement. All of these issues are taken care of by their competent doctors. Dr. Iqbal Mirza, is a humble and competent person. He is considered a valuable asset to the hospital, because of his services for his patients. These services include ligament reconstruction, lower back pain, musculoskeletal infections, osteoporosis, pelvic-acetabular surgeries. They have all the tests facilities, which are, bone scans and x rays. They do all the important surgeries at AMC, they have updated the whole list of surgeries for the convenience of their patients. You can visit their hospital to get the complete knowledge of their services. For starters, they do knee replacement surgeries, knee replacement surgeries, laparoscopy, neurosurgery, and ENT related surgeries. The success rate of their surgeries is really high. Many patients come for the surgery because of recommendations. They have a huge inventory in the pharmacy and we provide prescribed medications to the patients.